Feng shui is all about good energy, and you can welcome this energy with a strong, auspicious feng shui front door. Because it is through the front door that the house absorbs most of the energy it needs in order to nourish your personal energy, it is important to do your best in creating a strong feng shui front door. The easiest way to do that is to find the appropriate feng shui design for your door - be it with colors, shapes, images, or materials. The best feng shui design is the one that nourishes the feng shui element that corresponds to the direction your front door is facing. For example, if you have a north facing front door, you will focus on nourishing the water feng shui element that "governs" this direction; if east is the direction of your front door, then attention is needed to nourish and strengthen the wood element of the east. The best choice of color for your front door is one of the easiest steps, feng shui-wise, to strengthen its specific energy. In feng shui, the energy of the door is determined by its facing direction, so there are 8 different guidelines for front doors that face each of the 8 directions. A northeast facing door has the compass reading from 22.5 to 67.5. Not sure how to take the compass reading of your front door? Taking a compass reading of your front door will help. The feng shui element of northeast direction is earth, and the corresponding feng shui bagua energy is the energy of spirituality and personal growth. When you have a Northeast facing front door, there is one more feng shui element that you can use as an additional choice of color. The feng shui element of fire is nourishing for the earth element because it creates it, thus the fire element colors are also good for a northeast facing front door. So, the best feng shui colors for a Northeast facing front door are (in order of their auspiciousness): earthy/sandy colors, yellow, burgundy red, purple, deep orange, and rich pink. If you can easily repaint your front door, then all this info sounds good. However, what can you do if you cannot repaint it? There are several good feng shui decor solutions in case the door color cannot be changed. Be sure to choose what works best for your front door - from specific color pots to the materials and textures surrounding your front door. 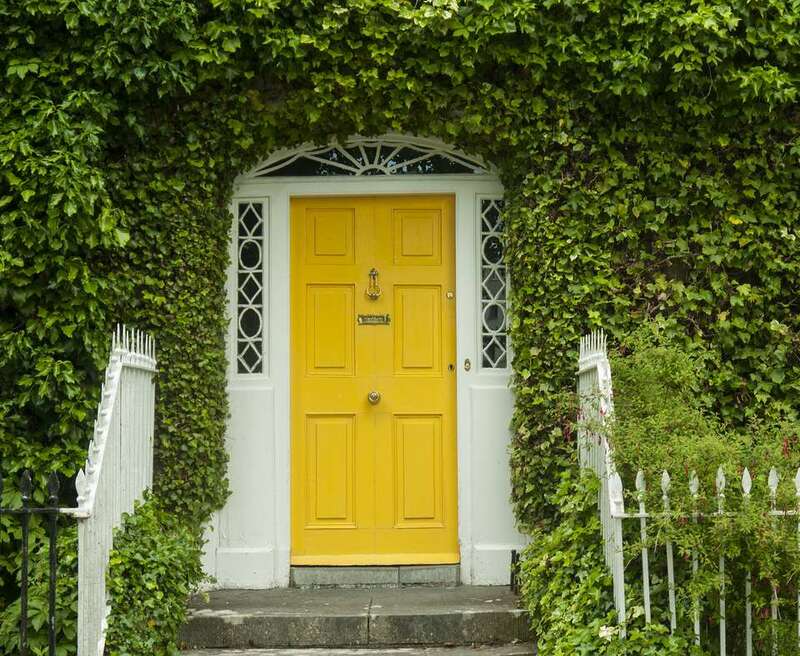 What Feng Shui Colors Are Best for Your North Front Door?